Gears Of War will be turning 10 Years old on November 7, The Coalition has planned for Gears of War 4 in honor of the big 10. Players will notice a few updates and some goodies. For more details check it out in our blog. Players who own Dead Island Definitive Edition, a new short update went live on Friday. Check it out right here. EA SPORTS UFC 2 was announced to be joining the EA Access Vault on November 10th. Forza Motorsport 6: Apex had been in an open beta for several months before it became a full release title not long ago. This week, the free game has had some surprise DLC drop making a Premium Edition bundle that you can buy for $16.99. The base game is still free, but this adds two new car packs and the Nürburgring track. The Holiday update has arrived! If you’ve been waiting for Looking for Group and Club features since they were announced at E3 then the wait is over. It has been pushed out to Xbox One systems, Windows 10 and all versions of the Xbox app. For details on all of the new features read this. Microsoft also celebrated one year of their backward compatibility program this week by adding Skate 3 to the list. This has been one of the most requested titles by fans so it was a fitting way to celebrate. Check out the Deals of the week section at the bottom to see it for half price and a limited time free DLC pack. On N7 Day we got a new trailer and pre-order pages for Mass Effect Andromeda have now opened. For more information check it out in the blog. Today, Ubisoft released a trailer for Survival, showcasing how you’ll need to brave harsh weather conditions and hostile environments in order to stay alive, all while supplies are low. Survival will include a new 24-player mode where players begin with low-level gear. Other than that not much information was provided or a release date. With the announcement of the Nintendo Switch in the last few weeks, we have additional news regarding their current system, the Wii U. As of this week all production for the system in North America has ceased and retailers have everything they will be selling through the end of the year. In Japan, production is still continuing, but they say it will stop “soon” for them as well. Players who own Mafia III, a new patch notes is available along with a Free Outfit DLC and it’s available right now. To see what improvements and outfits you’ll be receiving check it out in the blog. The Elder Scrolls V: Skyrim Special Edition will be having it’s first Update 1.1 and it will be short. The update will focus on general performance and optimization fixes, as well as addressing some issues that the community has spotted. To see what improvements check it out right here. Starting on November 18 and ending the 21st, players can play Overwatch for free. As with previous free weekends, participants will have access to Overwatch’s full 22-character roster and all 13 maps. If you missed out on September you have another chance next week. If you’re a fan of Metro: 2033 and Metro: Last Light video games well you’re in for a surprise. For those that don’t know, the games are based on books written by the Author, Dmitry Glukhovsky. 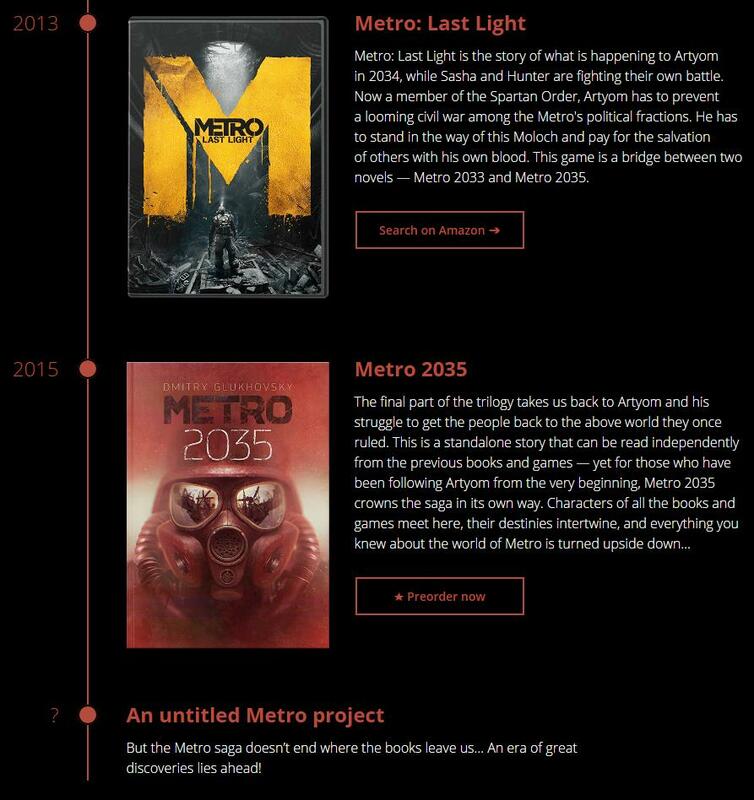 After the most recent entry into the book series, 2015’s Metro 2035, a headline has appeared next to the year 2017 with the title “The next Metro video game.” It recently changed to “An untitled Metro Project”. You can see for yourselves. New games are all over the place this month and posting one of your clips could be enough to win our video contest. Just check out the thread and see what you have to do. Tagged Dead Island, Forza Motorsport 6: Apex, Gears of War 4, Mafia III, Mass Effect Andromeda, Metro 2033, Nintendo, Overwatch: Origins Edition, Skyrim, The Division.